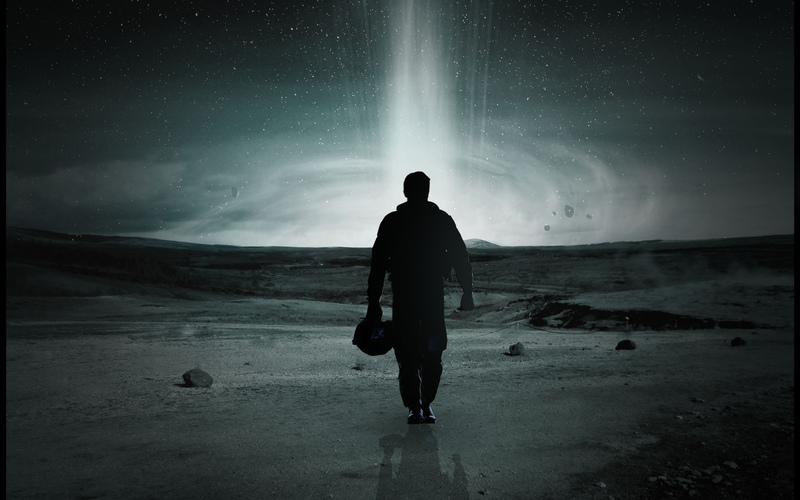 INTERSTELLAR is well-acted, well-shot, ambitious, emotional, epic, visionary and a crushing disappointment. More than any other film previously directed by Christopher Nolan, it brazenly seeks to up the standards for filmmaking. If only a few disastrous decisions in the script department didn’t undermine it all. Like many children, Cooper (Matthew McConaughey) always wanted to be an astronaut. Unlike most adults, Cooper is still bitter that he couldn’t be, especially since he has the smarts and training to back up his aspirations. He’s a widower with two children, including a son who is rooted firmly in the land and a daughter who shares his love of the stars. But the dreams of both Cooper and his daughter are nigh but impossible in the modern world. Because as is the case in most science fiction, the future is just terrible. This time, the apocalyptic event takes a form recalling the Dust Bowl on a global scale. A lack of rain combined with dust storms are killing the crops. The world depends on farmers as it continues to run out of food (though they have veggies enough to make the beer they continue to chug). I did wonder why synthetic or genetically modified foods weren’t given more credence, but then this future world doesn’t exactly have a rosy opinion of science. In fact, scientists seem to get much of the blame for climate change, never mind that the vast majority of them have been warning about it for decades. This is probably the most disturbing aspect of the film, not the possible end of times but the ignorance that accompanies it. NASA and similar scientific agencies have been dismantled and even more troubling, their accomplishments are being slowly written out of history. The official story in school textbooks is that the United States faked the moon landings in order to force the Soviet Union into economic collapse. Yes, look out for those crazy people who comment in all caps on YouTube videos while pitching their half-baked theories because the future apparently belongs to them. And though it is never stated, you can bet that in addition to moon landing deniers, people who also doubt the validity of vaccines, 9/11, evolution and yes maybe even climate change are probably running the show. No wonder the world is in such a shambles. Anti-intellectualism makes slaves of us all and yet, some people seem to embrace it. The manner in which some directly oppose gleaning new information through thought, theory and painstaking research is frightening. Religion gets a lot of the blame for this and sometimes it applies. But religion is never mentioned in INTERSTELLAR, so it’s not necessary to worship anything of note when sticking your head in the sand. The shortsighted school of thought featured in this film is endemic of its own fear and hopelessness. Picking one target to blame it on, as tempting and seemingly appropriate as it may be, is too easy. This is where anti-intellectualism gets us. It makes us focus on surviving instead of living. It gives way to fear and ends the argument rather than start a debate or ponder the possibilities. Whether used out of fear, ignorance or political gain, anti-intellectualism is the real plague that threatens to destroy us on a daily basis. Give INTERSTELLAR credit for understanding this. Thanks to anomalies pointed out by his daughter, Cooper finds his way to an out of the way government facility. It’s all that remains of the once great NASA, which was not disbanded as previously believed, but has lived on in the shadows as it tries to discover a way to save the world. Years ago, when the world was already in dire straits, a wormhole appeared near the edge of Saturn. Discovering that it could lead to a number of hospitable planets, astronauts were sent through in order to find a new home for humanity. That was over a decade ago and while a few people continue to ping back data, no one knows what became of the so-called Lazarus Expeditions. In an oddly provident though slightly dubious sense of timing, Cooper is enlisted to captain a mission through the wormhole and discover what happened to the Lazarus missions. He will have to leave his children for God knows how long and is barely given a day to prepare. This is, of course, just the beginning of a very long journey. He and his scientist crew (a group of generally well-rounded characters played by Anne Hathaway, David Gyasi and Wes Bentley) have promising data from three of the Lazarus astronauts, each transmitting from a different earthlike planet. Upon deciding on their first course of action, they need to deal with all the problems of space, particularly the cruel tricks of time dilation. Though he is obviously trying to push cinema forward with INTERSTELLAR, Nolan looks backward to recapture some of the techniques being left behind in this digital age. He shot the film on 70mm film stock and utilizes practical effects whenever possible. As for the film itself, it brings up a number of intriguing themes and makes no bones about exploring them. One of the problems of the film is not that Nolan is trying to make something that is endlessly profound, it’s that we can sense him trying. Every discussion seems like Nolan is taking the audience by the lapel and sitting them down, making sure you get every last detail of what they are dishing out. Some critics have said the film is confusing. It is, but not in that it brings up such advanced subjects but only in the forceful manner in which the audience is bombarded with them. Believe me, I’m thrilled we have a smart blockbuster to talk about for a change. So many big budget films talk down to their audience it feels that the MPAA ratings should not have minimum age requirements, but maximum ones. With INTERSTELLAR, we have a film that wants to present advanced science along with a more personal story about love, family and commitment. That’s even better. But Nolan has difficulty presenting both cold science and warm emotion with equal measure. The film is long, but not as long as other ambitious films. Still, you feel every one of INTERSTELLAR’s 169 minutes, as Nolan takes on the role of a teacher who doesn’t have the pulse of his class and thus fails to keep them riveted. Still, things are interesting at least most of the time. Or at least, for the first half to two-thirds of the film. But then, we are given a one-two punch in the plot twist department. Our senior NASA adviser (Michael Caine) delivers the first of them. It’s shocking yes, but also brings up a lot of uncomfortable questions. Suddenly, a film that went to such lengths to link every thread of the story develops major plot holes. It makes the audience think not about the ethical questions linked to the plot twist, but how that plot twist could make much sense in the larger picture of things. Defenders of the film insist it works, but I personally don’t see it. The next twist is even worse and it involves the introduction of a new character. We spend a great deal of time with this person and the place he calls home. Again, I have listened to the arguments defending this and what it was meant to add to the film. They’re good arguments but I have to dismiss them. For a film that went to such great lengths to be smart, INTERSTELLAR takes a brief detour into territory more in tune with Michael Bay’s ARMAGEDDON. Adding little to the story, it’s a stunningly misguided segue that eats up valuable time. Even when the film gets its head back in the game, it is never able to fully recover. From then on, the film ups the ante in not just science but metaphysics. These leads to a trippy third act that is several times more sentimental than the often criticized conclusion of Robert Zemeckis’ CONTACT. As a rather emotional person, I have nothing against this. However, the way this links up with the rest of the film is highly problematic. To put it bluntly, once it became clear what was going on, I found myself rolling my eyes and cursing with disgust. The actors all do top notch work. It has been truly amazing to see the recent evolution of Matthew McConaughey. When he first came onto the scene, there were a few good performances, such as in John Sayles’ LONE STAR. But honestly, I failed to see why his fame continued for as long as it did. For those who have chosen to forget recent history, McConaughey spent a long time starring in some of the most generic and egregiously bad romantic comedies Hollywood was shoveling out. I’m talking about THE WEDDING PLANNER, HOW TO LOSE A GUY IN 10 DAYS, FAILURE TO LAUNCH and GHOSTS OF GIRLFRIENDS PAST, just to name a few. Many films in between had him playing to what was being seen as his accepted personality rather than an acting role (SAHARA, for instance) and even occasional good turns like FRAILTY seemed too little too late. Then, a few years back it was as if something in McConaughey suddenly sparked. I won’t belittle his talent by suggesting he suddenly “learned” to act. Rather, it was as if he exploded onto the scene with a mission to show the world just what he was capable of. McConaughey has gone from one of the least interesting movie stars out there to one of the most fascinating. His turns in MAGIC MIKE, MUD, TRUE DETECTIVE (which is basically a complex, eight-hour film in itself) and the incredible DALLAS BUYERS CLUB have been diverse, risky and endlessly rewarding to the audience. INTERSTELLAR is another feather in his cap, even if the script doesn’t always live up to his performance. Because INTERSTELLAR does have a heart, a big one. One of the most powerful aspects of the film is Cooper’s determination and loyalty to his family and how his adult children (admirably played by Jessica Chastain and Casey Affleck) deal with his departure in different ways. 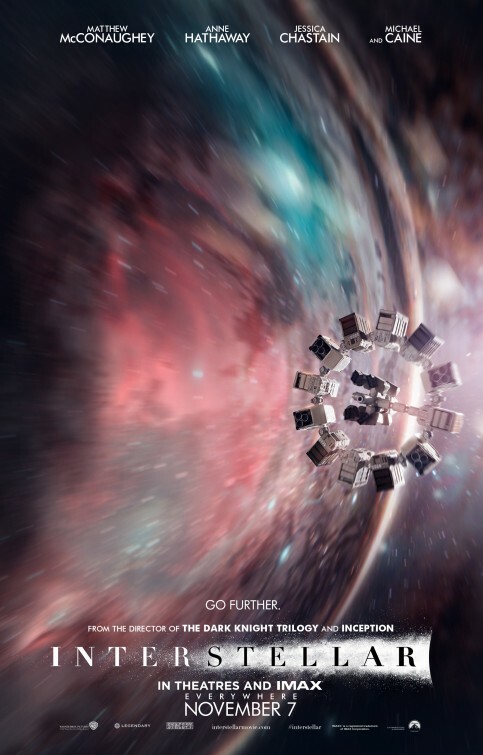 INTERSTELLAR is what I call a fascinating failure. It brings up a number of intriguing themes, too many to mention even in a review as long-winded as this. And yet, there are so many major problems both with the film’s basic presentation and where the story inevitably takes us. INTERSTELLAR may be an unforgettable cinematic experience, but that doesn’t necessarily make it a good one. Disappointing. Next Next post: The Spoiler Room Celebrates the Apocalyptic 80’s!